Let's talk about winter for a moment, shall we. It was 10 degrees this morning in Oklahoma. Ten. Let's just say that is a lot colder than it should be here. I don't mean to sound like a baby... never mind, I'm just going to be a baby about it. A couple of weeks ago it was in the 60s and we were having a grand old time playing outside, drinking lemonade and running around in our swimsuits (okay, the last one is a lie). But seriously, I hate cold weather so much. In light of it being socoldmyfingersarefreezingtomykeyboard, I'm wearing floral pants. I've worn them in the spring and in the fall, so I figured I might as well embrace them in ten degree weather. Winter Floral is a thing, right? Girl, I feel you. It has been freezing in TN, and most definitely much colder than I have ever dealt with in my life! What's a girl to do?! Those pants though, awesomeeee! May flowers! This has definitely been a rough winter! We are on our 5th snow day today! I don't think we've had 5 combined snow days in the last 3 years! I mean, yeah, I live in PA and we get legit winters here, but not this bad! I've been sneaking in the florals lately too to brighten my spirits. Ooooh! I like those pants. II think they work for winter because of the black background. 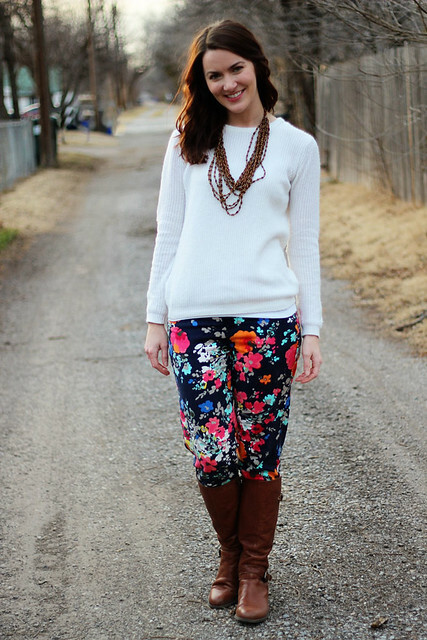 Love the floral pants! 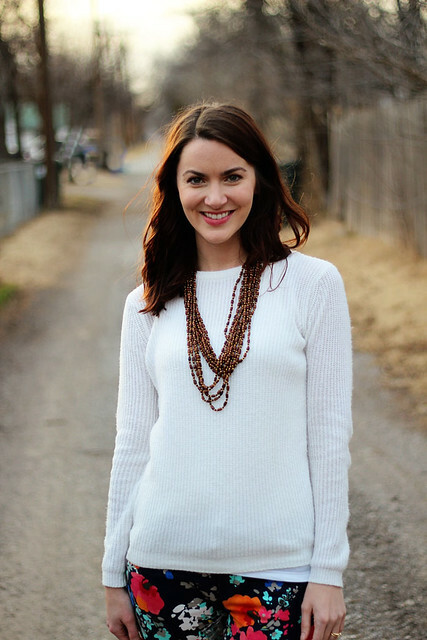 Esp paired with your white sweater. this winter has been so bizarre! I'm stuck at home today with all the snow, but I'm happy for an excuse to avoid the frigid temps! I like the winter florals look you have going here! absolutely gorgeous! there's nothing like wearing florals to bring cheer to your day. I am partial to floral print dresses myself :) As for the weather, we might be over the super cold sub-zero temperatures here in NC. time for rain, and lots of it. LOVING this look! And you'll be happy to know that I finally bought a floral piece - inspired by you of course. You look fabulous as always! Winter floral is totally a thing, especially with the black background! I love wearing florals in the winter because it is so unexpected. Looking cute! I'm so glad we haven't had weather that cold here but for a few days, and some of them I was in Florida for. Florals do make 10° look a whole lot warmer. love the pants! Im totally obsessed with florals right now! And I'm being baby about winter too! We have a high of six today! At this point I would take a nice 40 degree day! Well, if they aren't a thing, winter florals definitely should become one. Your pants are amazing! I love everything with flowers, though. And same thing with weather here! It's been in the 60s for weeks and now suddenly there's SNOW EVERYWHERE! Gah, frustrating. I don't even care that I'm being a baby, that's one of the reasons I moved here: warmth. I like the mango pants the best, which match your outfit post. Great boots. Yeah, so... I LOVE your pants! Love the look! I need more florals in my wardrobe.. I am so, so tired of winter weather too! I cannot wait for everything to be warm and alive again, but I have a feeling I might have to wait a while yet! I can't wait for warmer weather, I will be living in print pants-- until the heat strikes and it will be skirts and dresses with no tights or boots yayyy. Also, that necklace is really awesome. The weather has been so strange lately here too. A couple of days ago I was able to go outside without a coat and now it just snowed 10 inches! You look cute! Awesome pants!! Definitely the best way to brighten up a gray, winter day. You look adorable! This look is great!! 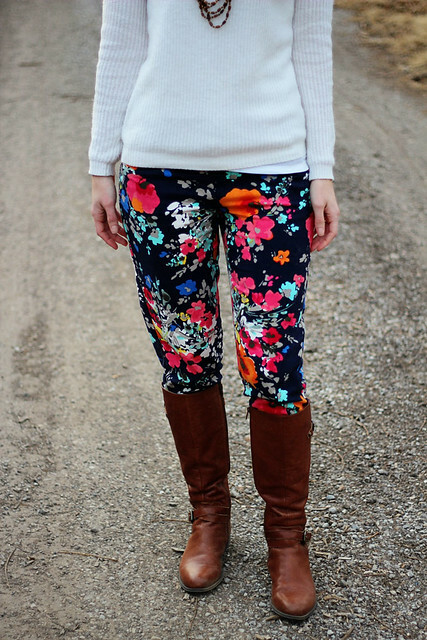 Love these fun winter florals! Makes me think spring isn't so far away. Your hair is beautiful, I wish I had those pretty waves. 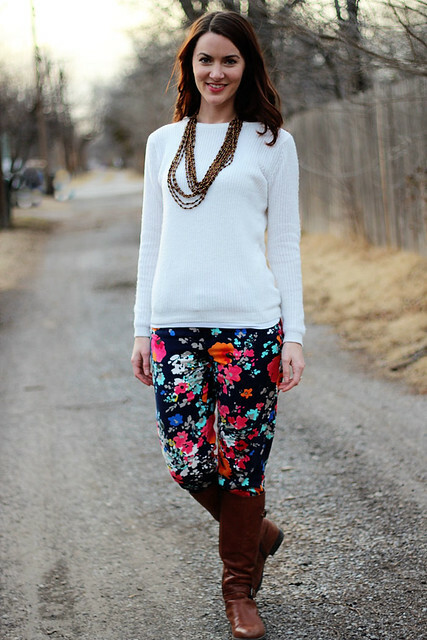 these floral printed pants are so much fun and definitely have me wishing for spring! I love floral pants! They look great on you. It's really cold here in MN too (like below zero, yuck). 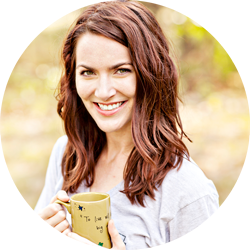 I think it's even harder to endure when your body isn't prepared for it. When there's such a huge temp swing, it totally throws you out of whack! Wow these pants are Amazing!!! I have a hard time finding floral pants that looks right but these are perfect.